Habit: Annual 2--9 dm. Stem: 0.5--1.5 dm, generally glabrous. Leaf: basal; blades (0.5)1--4 cm, 0.5--1.5 cm wide, hairy, some glandular. Inflorescence: 30--80 cm, 10--50 cm wide; branches glabrous, sparsely glandular at nodes; peduncles 0 or reflexed, (0.1)0.2--0.35 cm, straight, slender, glandular; involucres 1.2--1.5 mm, 1--1.3 mm wide, glabrous; teeth 4. Flower: 1.5--2.5 mm, hairy; perianth white to +- red (or yellow), lobes oblong-obovate, with a sharp, 1--2 mm tip or not. Fruit: 1.3--1.7(2.2) mm, glabrous. Chromosomes: n=20. 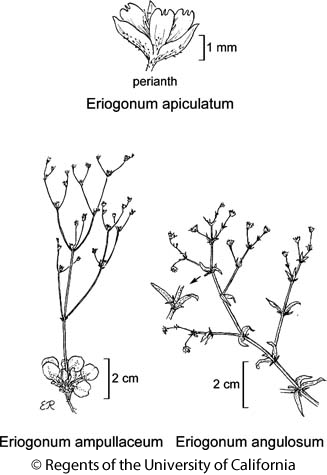 Citation for this treatment: James L. Reveal & Thomas J. Rosatti 2012, Eriogonum apiculatum, in Jepson Flora Project (eds.) Jepson eFlora, http://ucjeps.berkeley.edu/eflora/eflora_display.php?tid=24693, accessed on April 23, 2019.
e SnBr (Pipes Spring area, San Bernardino Co.), c&s PR (Santa Rosa, Palomar, Cuyamaca mtns), sw DMtns (Little San Bernardino Mtns). Markers link to CCH specimen records. Yellow markers indicate records that may provide evidence for eFlora range revision or may have georeferencing or identification issues. Purple markers indicate specimens collected from a garden, greenhouse, or other non-wild location.